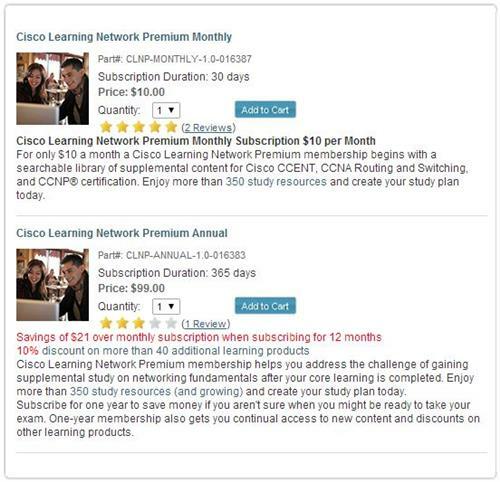 Even at $10 month-to-month, this is an excellent deal for access to the Cisco Learning Library. In fact, the enhanced search and library scan facilities are worth the price of admission all by themselves, not to mention the added study resources not available elsewhere. Those who sign up for a year also get discounts for on-demand e-learning, lab time for virtual access to Cisco runtime environments, practice exams and lots more. My best guess is that for those in serious pursuit of Cisco certification, the cost of a one-year premium subscription will be more than offset by savings on other stuff that such folks are likely to purchase from Cisco in the course of that pursuit anyway. In my book, that makes this subscription a pretty good deal all the way around! In fact, it’s such a great concept that I won’t be at all surprised to see other vendors with similarly large and complex “market baskets” of cert prep training and materials to take a similar approach to reaching their target cert audiences, too.